Solar Panel or Photovoltaic (PV) is a technology that converts sunlight directly into electricity. It was first observed in 1839 by the French scientist Becquerel who detected that when light was directed onto one side of a simple battery cell, the current generated could be increased. In the late 1950s, the space program provided the impetus for the development of crystalline silicon solar cells; the first commercial production of PV modules for terrestrial applications began in 1953 with the introduction of automated PV production plants. Today, PV systems have an important use in areas remote from an electricity grid where they provide power for water pumping, lighting, vaccine refrigeration, electrified livestock fencing, telecommunications and many other applications. However, with the global demand to reduce carbon dioxide emissions, PV technology is also gaining popularity as a mainstream form of electricity generation. Several million solar PV systems are currently in use worldwide, with an installed capacity of over 6.6GW globally (2006), yet this number is a tiny proportion of the vast potential that exists for PV as an energy source. Photovoltaic modules provide an independent, reliable electrical power source at the point of use, making it particularly suited to remote locations. However, solar PV is increasingly being used by homes and offices to provide electricity to replace or supplement grid power, often in the form of solar PV roof tiles. The daylight needed is free, but the cost of equipment can take many years before receiving any payback. However, in remote areas where grid connection is expensive, PV can be the most cost effective power source. The majority of the world’s developing countries is found within the tropics and hence have ample sources of solar insolation (the total energy per unit area received from the sun). The tropical regions also benefit from having a small seasonal variation of solar insolation, even during the rainy season, which means that, unlike northern industrial countries, solar energy can be harnessed economically throughout the year. China, India and other developing countries are emerging as major solar PV manufacturers. As of 2004, China had 70 MW of cell production capacity and 100 MW of module production capacity, compared to the world total module production capacity of 1,150 MW. In the Philippines, Sun Power doubled its production capacity to 50 MW in 2004. In Thailand in 2004, Solartron PLC, a solar-cell module assembler, announced plans to develop the country’s first commercial solar cell manufacturing facility, with annual capacity of 20 MW production from 2007. 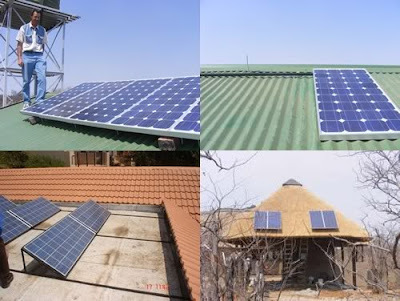 The dominant application for PV in developing countries is the solar home system (SHS). This involves the installation of PV systems of 30 to 50 peak watts (Wp), costing about $300 to $500 (U.S.) each, in individual homes, mainly in rural areas. A few attempts have been made to establish PV-powered village power grids in developing countries. Cost has been the major barrier to the widespread uptake of PV technology. Since 1976, costs have dropped about 20% for each doubling of installed PV capacity, or about 5%/year. Module prices have fallen from $30/Wp in 1975 to close to $3/Wp today. Costs rose slightly in 2004 due to high demand (which outpaced supply) and the rising cost of silicon. There is still the expectation that the cost of PV will come down as mass production increases and technologies evolve. Note: Cost of PV modules is usually given in terms of Peak Watt (Wp), which is the power rating of the panel at peak conditions – that is at 1kWm-2 irradiance at 25ºC. The nature and availability of solar radiation is described in the technical brief Solar Thermal Energy. Once the solar energy has arrived it needs to be captured and this can be done using photovoltaic panels. When light falls on the active surface, the electrons in a solar cell become energised, in proportion to the intensity and spectral distribution (wavelength distribution) of the light. When their energy level exceeds a certain point a potential difference is established across the cell. This is then capable of driving a current through an external load. All modern, commercial PV devices use silicon as the base material, mainly as monocrystalline or multi-crystalline cells, but more recently also in amorphous form. Other materials such as copper indium diselenide and cadmium telluride are being developed with the aim of reducing costs and improving efficiencies. A mono-crystalline silicon cell is made from a thin wafer of a high purity silicon crystal, doped with a minute quantity of boron. Phosphorus is diffused into the active surface of the wafer. At the front electrical contact is made by a metallic grid; at the back contact usually covers the whole surface. An antireflective coating is applied to the front surface. Typical cell size is about 15cms diameter. The process of producing efficient solar cells is costly due to the use of expensive pure silicon and the energy consumed, but as materials technology improves costs are slowly dropping making PV technology more attractive. The modules in a PV array are usually first connected in series to obtain the desired voltage; the individual strings are then connected in parallel to allow the system to produce more current. They are then protected by encapsulation between glass and a tough metal, plastic or fiberglass back. This is held together by a stainless steel or aluminum frame to form a module. These modules, usually comprised of about 30 PV cells, form the basic building block of a solar array. Modules may be connected in series or parallel to increase the voltage and current, and thus achieve the required solar array characteristics that will match the load. Typical module size is 50Wp and produces direct current electricity at 12V (for battery charging for example). Commercially available modules fall into three types based on the solar cells used. Mono-crystalline cell modules. The highest cell efficiencies of around 15%-18% are obtained with these modules. The cells are cut from a mono-crystalline silicon crystal. Multi-crystalline cell modules. The cell manufacturing process is lower in cost but cell efficiencies of only around 15% are achieved. A multi-crystalline cell is cut from a cast ingot of multi-crystalline silicon and is generally square in shape. Amorphous silicon modules. These are made from thin films of amorphous silicon where efficiency is much lower (10%-12%) but the process uses less material. The potential for cost reduction is greatest for this type and much work has been carried out in recent years to develop amorphous silicon technology. Unlike monocrystalline and multi-crystalline cells, with amorphous silicon there is some degradation of power over time. An array can vary from one or two modules with an output of 10W or less, to a vast bank of several kilowatts or even megawatts. Flat plate arrays are held fixed at a tilted angle and face towards the equator, are most common. The angle of tilt should be approximately equal to the angle of latitude for the site. A steeper angle increases the output in winter; a shallower angle – more output in summer. It should be at least 10 degrees to allow for rain runoff. Tracking arrays follow the path of the sun during the day and thus theoretically capture more sun. However, the increased complexity and cost of the equipment rarely makes it worthwhile. Mobile (portable) arrays can be of use if the equipment being operated is required in different locations such as with some lighting systems or small irrigation pumping systems.